Designed by mums for babies, toddlers and pre-schoolers, babyboomboom ® is a musical, fun and participative way to familiarise your child with a second language. Don't wait until they start school - give your child a headstart in life! 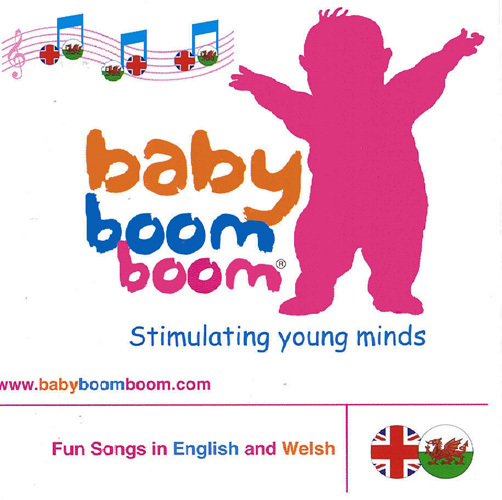 The CD features nursery rhymes and songs in English and Welsh. Each verse of the song or rhyme is first sung or spoken in English and then is repeated in Welsh. Please note that in order to fit the words to the music, sometimes the Welsh verses are not an exact word-for-word translation of the English. This product is suitable for use by a parent and baby with no previous knowledge of Welsh. The songs aren't necessarily intended to teach specific Welsh words and phrases but more to introduce young children to the sounds of another language.